Abelardo "Lalo" Perez has been a drummer all his life. Prior to the store's beginning, Lalo, as well as other drummers in the Alice area had to drive one hour to Corpus Christi just for a pair of sticks. Lalo and his wife Amy had the idea of opening a store that sold music accessories such as drumsticks and guitar strings. The first store opened for business in 1979 in a small 16 X 20 store, just big enough to sell their accessories and even a few guitars and drum sets. Within six months, the store had grown and needed a larger location. Lalo's Music moved down the street in downtown Alice, into the historical William Adams building. Lalo's Music now carries a full line of drums ranging from Mapex to Tama Drums. 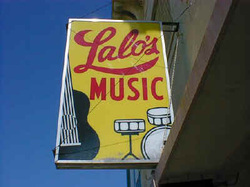 Lalo's Music also carries guitars, amps, school band instruments, and much more. Since Alice is the official birthplace of Tejano music, we always have a good selection of bajo sexto guitars, and accordions. The store is still owned and operated by Lalo and Amy Perez and family.